The Actors Studio warmly invites you to come support and experience an exploration that our Studio member, Marek Prystup, has created. Come enjoy this inventive one man show, THE CLOWN OF GOD, that reveals the time that world famous dancer, NIJINSKY, spent in an insane asylum. 5 performances: Thursday, Dec 6th through Sunday, Dec 9th, all at 7:00pm with one matinee on Saturday, Dec 8th at 3pm. Running time: 60 minutes, no intermission. There will be one talk-back on Thursday, December 6th, moderated by Ellen Burstyn. 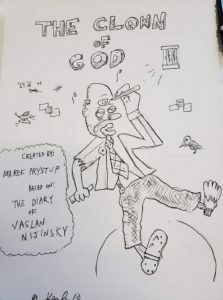 From Marek Prystup: One day I came across the diary of Vaslav Nijinski in a library. I was mesmerized by the thoughts expressed by this wonderful man while he was confined in an insane asylum. I started to explore the unusual journey of this artist, and dancer, whose life was sacrificed for the love of truth and humankind. The idea came to me right away to create a one man show based on his diary and try to express his feelings through movement and music. “The Clown of God” is a trial to analyze the process of expanding human consciousness through the life of a great artist and a great man.